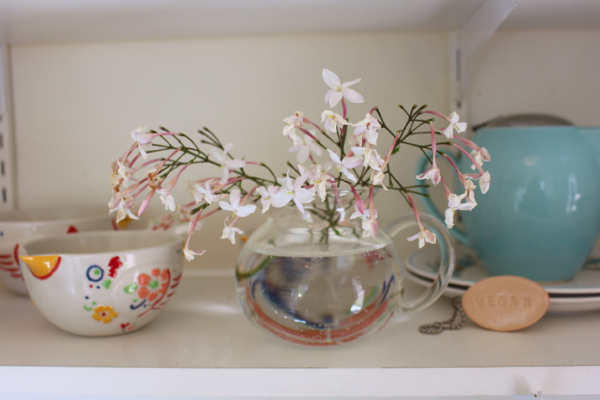 This time of year, the pink Jasmine is blooming all over my yard and all over the city, and so I bring sprigs inside every few days, sprinkled around the house so we can live jasmine-scented lives . . . The other night I went reading back through the archives here on this blog, which is something I like to do from time to time. Life changes so much and quickly. I’m grateful to have many years of mine recorded here, just a click or two away at any given time. It’s one of my favorite things about having a blog, actually. And man o man, my life has changed a lot over the years! These days are overflowing, bursting at the seams, rushing and stretching and never quite managing to fit it all in. But it’s good. So good. We wake up. 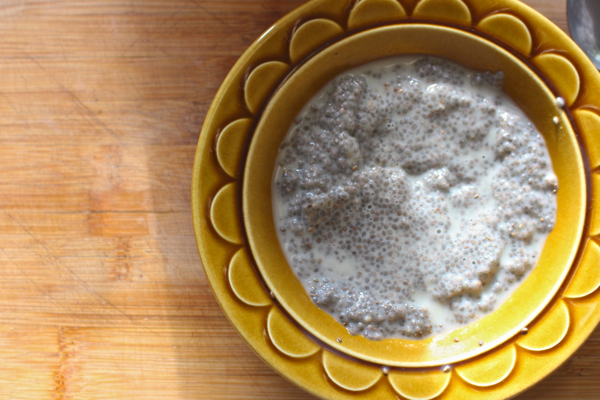 I put on a kettle to boil for tea, and fix Waits a bowl of chia pudding – almost always chia pudding these days. 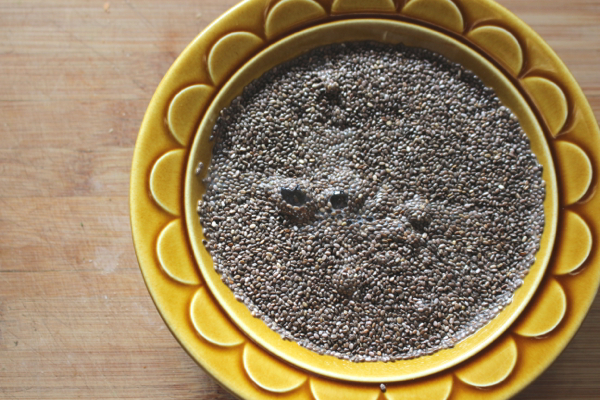 That up there is the chia, beginning its soak. While the kettle heats and the chia gels, I fix the kid his lunch. A large “share snack” for all his classmates to partake in, plus one or two grounding foods just for him. 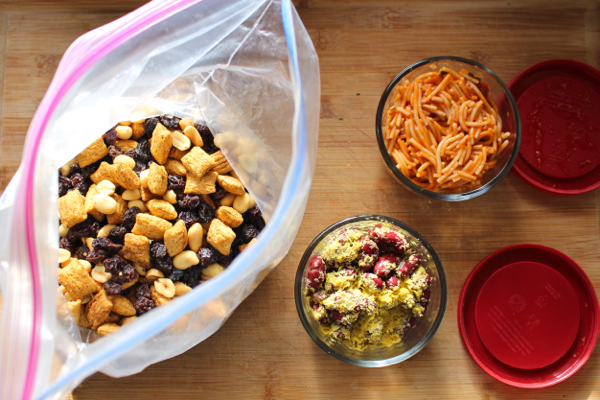 On this day I packed a homemade trail mix for the kiddos to share, and for him a small bowl of leftover pasta and a small bowl of kidney beans + olive oil + nutritional yeast. 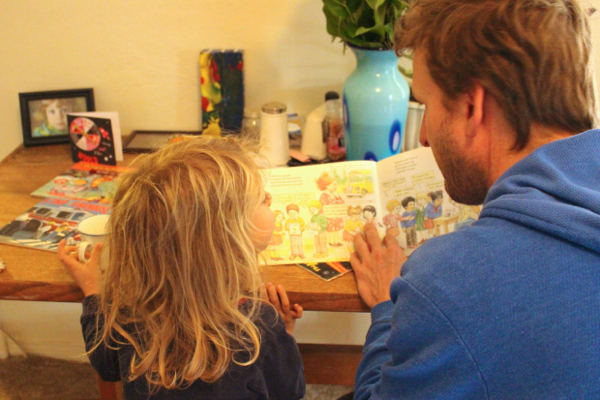 Waits eats his breakfast – chia pudding and a glass of oat milk – while Jeremy reads to him. He’s super into The Magic School Bus series right now, which I love because they’re all about science! His favorites are the ones where they go inside the human body. Ask him where food goes when you eat it, he’ll tell you the entire progression, teeth to poop. And oh boy, don’t even get him started on the white blood cells! While they do that I’m continuing my kitchen work: making my lunch, and Jeremy’s too. And drinking black tea, oh yes. Lots and lots of black tea. 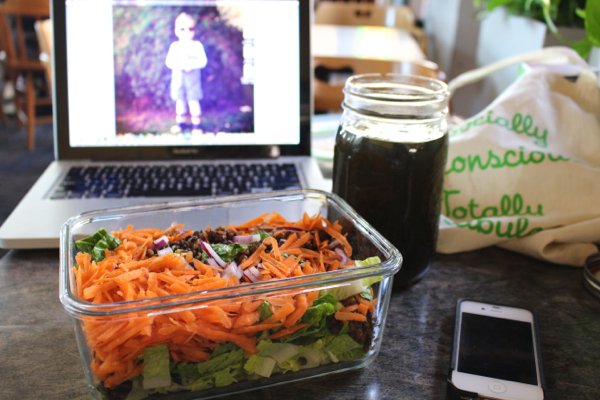 Left: my lunch, an enormous simple salad with shredded romaine, lentils, quinoa, grated carrot, and red onion. 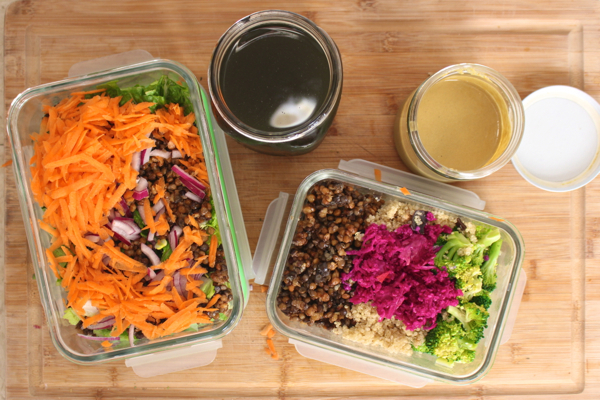 With my famous homemade tahini dressing on the side. 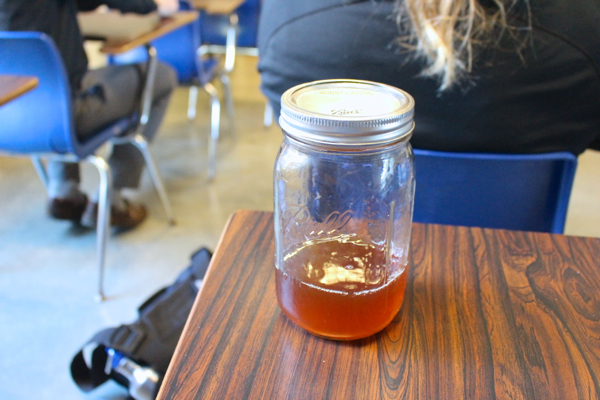 The giant (that’s a 30 ouncer) mason jar is full of iced nettle infusion tea, which I’ll have with lunch. Jeremy’s lunch is leftovers from the night before: lentils, quinoa, and steamed broccoli, topped with my godfather’s homemade purple sauerkraut. Accompanied by the same amazing tahini sauce on the side. 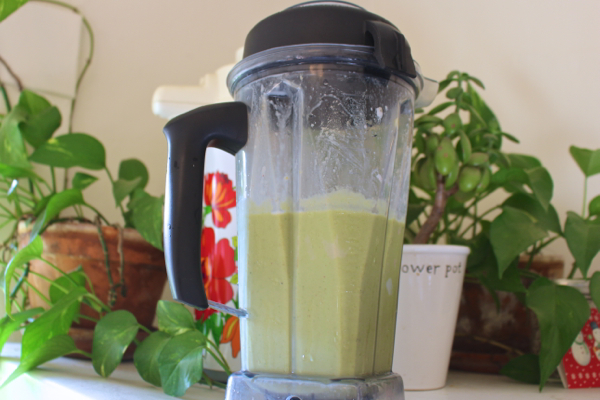 And finally, my morning kitchen mission ends with a big blenderfull of green smoothie, which we share. Getting us back on green smoothies is one of the best things I’ve done for our diet recently! 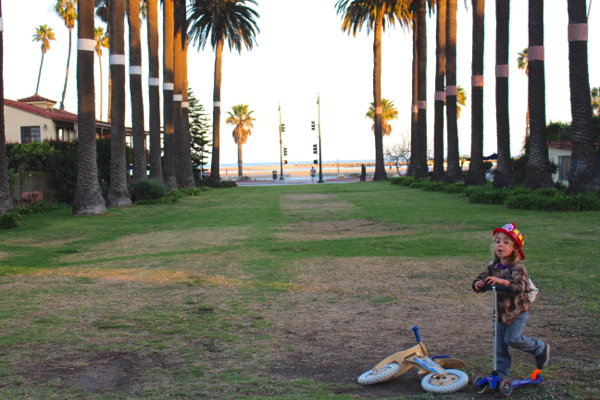 It’s funny how the smoothie cycle ebbs and flows. These days our smoothie recipe is pretty standard: 2+ cups plant milk, a few handfuls spinach, kale, collards, or some combo of these, 2 large scoops protein powder, 1 ripe banana, about a cup of some other frozen fruit, a tablet of zinc, a capsule of K2, and a capsule of probiotics. Sometimes I’ll add a scoop of peanut putter . . . because peanut butter. Once the smoothie is portioned and poured, my kitchen work is done. I’m chasing Waits around, wrestling as we get dressed, trying to make a game out of getting ready. Scrambling. And finally, somehow, we’re out the door – draped in book bags and lunch bags and tea-to-go and a kiddo in my arms, kissing Jeremy goodbye and heading out to school, the both of us. I drop Waits off at preschool, and then head out to UCSB for my first class. Parasites! After class, I haul my books, computer, and food over to the UCEN, where there’s comfy seating and blessed wifi. That’s where I’ll park for the next few hours, working on my computer and at some point in there, eating lunch. On this particular day, I splurged and grabbed some locally-made nut butter and some artisan local jelly, both of which were adorably packaged and completely delicious. This is a newish Canadian company that makes all-organic, vegan, gluten-free whole foods snack bars (and as an aside, their website is gorgeous. Like, seriously gorgeous!). 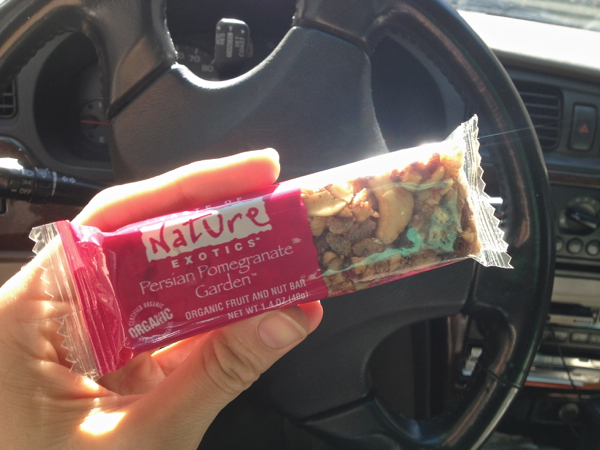 What really caught my attention with the Taste Of Nature bars is that they’re made exclusively from fruit, nuts, seeds, and natural sweeteners. That’s it. They’re a lot like Lara Bars, but unlike Lara Bars, they’re completely organic! Which is ace in my book. They’re also made in Canada and the company uses green manufacturing, packing, and shipping practices. Basically they’re all-around awesome and they get two big thumbs up from me. Which is why, at the end of this post, I’ll be giving away 3 boxes of them! So keep reading . . .
On Wednesdays I pick up Waits just before dusk. 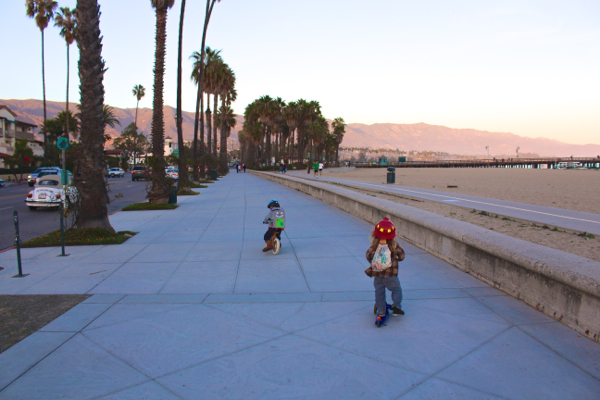 And on this Wednesday, we met with some friends down by the beach, for a sunset cruise – the boys both tooling around on their little vehicles, the mamas walking and talking a few paces behind them. 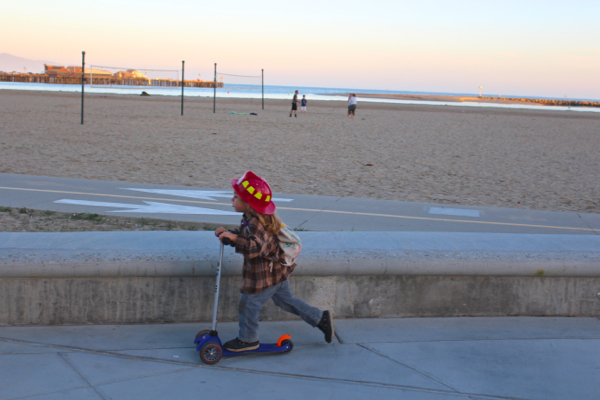 It was a gorgeous evening, rolling and strolling past the harbor, the breakwater, the pier, and finally down to the skate park. We hung out a bit by the skate park, watching in awe as the big kids flipped and flew through the air. Some day, kiddo. Some day. At sundown the temperature plummeted, and it was time to head home. Earlier that day Jeremy had mentioned he was craving a TLT, so that’s exactly what I made for dinner. 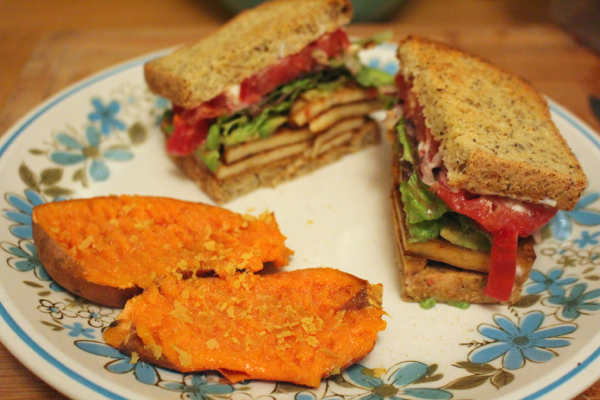 Baked “bacon”-style tofu, lettuce, and tomato sandwiches with plenty of Vegenaise, plus a side of baked sweet potato with nutritional yeast and coconut oil. Waits had a vegan cheese and olive pizza on whole wheat crust, with a side of kidney beans and carrot sticks, but I totally forgot to take a picture of that. Whoops! After bath time and getting-ready-for-bed time, all it took was a single book and a single song and he was asleep, allowing me to work until Jeremy got home around 10:00. Late nights are for my man, chatting about our days while he eats – this time on his much-desired TLT and baked sweet potato. It was a long day. 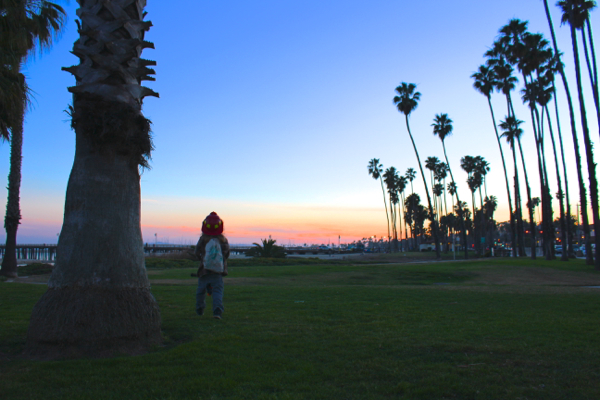 Another crazy day in Cali, in this crazy crazy life. But undoubtedly, a very good day. Giveaway time! 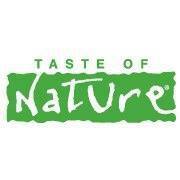 Alright friends, Taste Of Nature is generously offering a 6-bar variety pack full of wholesome, organic, vegan and gluten-free snack bars to THREE lucky blog readers. Yay! And here’s the deal. I think “like-gating” / “fan-gating” is weird and insincere and it squicks me out and I’m just not down for it. So I’m not going to make you do it. That said, the truth is that social media stats are pretty important these days, in blogging as well as in business. So no, I’m not going to require you to “like” me all over the Internet just to enter this giveaway. But, if you do like my blog and enjoy the work I do here – and this goes for any blog really – then liking my Facebook page, or following me on Instagram or on Twitter is a great, easy way to help me out. Those numbers actually really do count. And the same goes for Taste Of Nature. No, I won’t manipulate you into following them as a way to get more entries in this contest. But if you’d like to support an awesome organic vegan gluten-free company, a great way would be to like them on Facebook, or follow them on Instagram or on Twitter. But you don’t have to! No coercion. Fair? Now, if you want to enter, what you DO have to do is just to leave a comment here, on this post. And let’s see, how about . . . tell me your favorite nut! Okay, go. Good luck y’all! Edited to add: giveaway will end Thursday 6 March at midnight PST, and winners will be announced Monday! I love cashews, although I recently discovered these cinnamon almonds that are ridiculously addictive. Thanks for the giveaway! Favourite nut? Pecans. Roasted pecans, especially. Roasted pecans with *vegan* ice cream and fudge, most especially. Maybe throw a bit o’ caramel in there if I’m feeling crazy. Did I mention that I like pecans? I’d have to go with almonds…they are cheaper than cashews or walnuts and are a daily snack for me!! I personally love pistachios! I tend to always get pistachio ice cream is that’s a choice. I really love pistachios, with cashews being a close second. I love pecans, especially roasted with some chili and then sprinkled with some orange zest. OM NOM. Almonds are my favorite even thought they aren’t technically a “nut”. It makes my favorite kind of milk, a nice salad topping, and is a great snack in general. Cashews! If only because I’m currently obsessed with all cashew based creams. Almonds. I eat almonds every. single. day. Roasted, raw, soaked and dehydrated, whatever. I keep a bag in my car, one next to my chair in the living room (next to my knitting) and a bag in the kitchen. I eat about 3 lbs a week. I eat all other nuts, too, but the almond is queen nut in my world. I go through phases – recently it was pistachios, but now I’m on to peanuts (well, peanut butter, actually) and sometimes cashews. My favorite nut? Cashew because… Cashew cheese, cashew cream, cashew ranch dressing, cashews in Thai food, cashews in soups and smoothies and, well…just plain old cashews! I love all nuts, it’s so hard to pick one! I’ll go with pecans though, especially spiced ones. 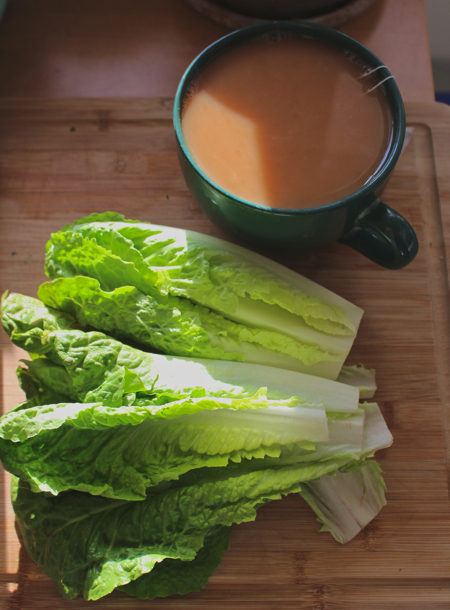 Absolutely delicious simple addition to salads, oatmeal, yogurt… basically everything! Totally in love with sunflower seeds right now. 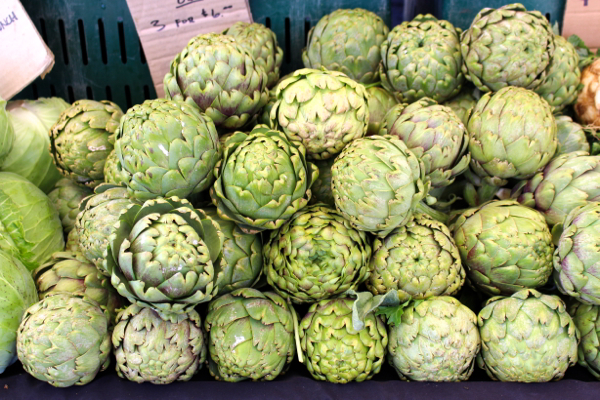 Raw and unshelled, they are the perfect pantry staple to add to my weekday lunch salads! Pili nuts are incredible – I think of them as giant pine nuts. A very special & rare treat. Wonderful raw. Speaking of incredible – your blog has never failed to bring inspiration and light into my life as well as awesome food ideas. Love to you & yours! I am so behind in blog reading! Your food all looks amazing, and I’m wishing I remembered the titles of these body books my kid loves – she’s 7 and has loved them for years – they’re only at the library in library bindings and there’s a book for each body system. She loves them. Does Waits hair stay neat all day? That pony tail is gorgeous, glossy perfection. 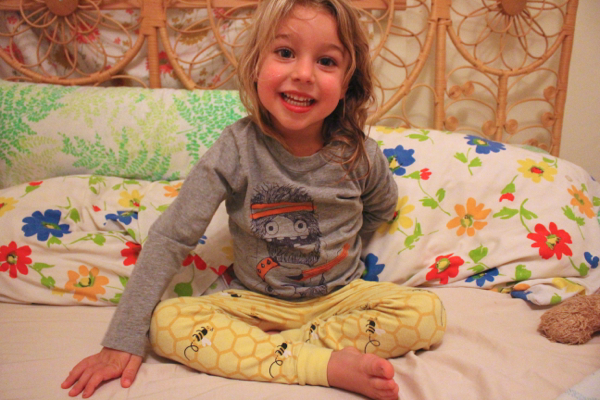 My kid’s hair always looks insane! Ha. This is why we’re psyched to get it re-cut into a bob on Wednesday. Thursday? Sayward, what do you put in your nettle infusion? I don’t include nettle in my infusion rotation as often as I should because of it’s murky, aggressive flavor. The best I have come up with is adding some peppermint while infusing and then adding lemon and stevia when it’s done. And it must be cold! I just put plain nettles! I don’t mind the flavor so much. It’s not, like, delightful or anything, but I don’t find it off-putting. But you’re right, it definitely must be iced! Oh those books sound amazing! Waits would love those. Sayward, could you tell me a bit more about the bread you used for the TLT? 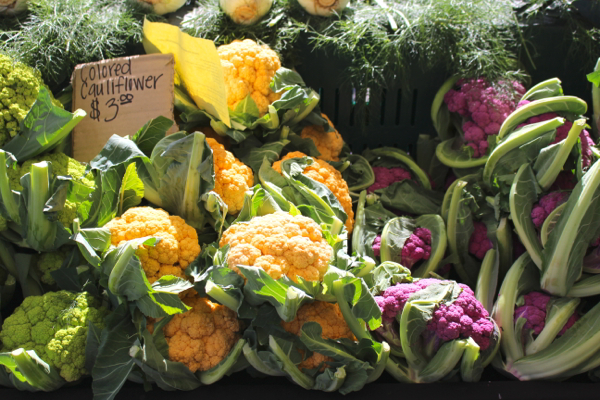 I was recently diagnosed with a gluten intolerance (boo!) and I’ve had no luck finding or recreating a good gf bread. Thanks! What is the benefit of black tea over others? Or are you just really digging the black tea right now. Trying to get back into healthy mode and I know you are a great source of information for this stuff. I’ve read that a very small portion of the population is gluten intolerant or has celiac disease. 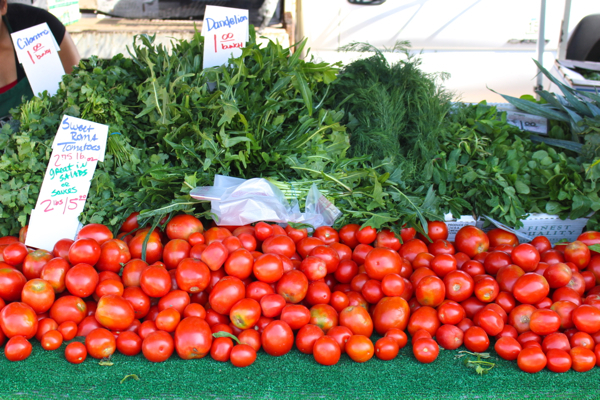 From what I’ve seen there is a lot of psuedo science on gluten free diets. What is your take? I like that it has more caffeine than green, and also has more of that coffee *feeling* (I add milk and stevia, just like coffee). But the amount of caffeine is much less than coffee, it doesn’t mess with me in the same way.